DONETSK, Ukraine -- “This doesn’t smell like peace to me,” said the Monk, sighing heavily in his makeshift control centre, a former chandelier shop in the basement of a block of flats, near the remains of what not long ago was Donetsk international airport. 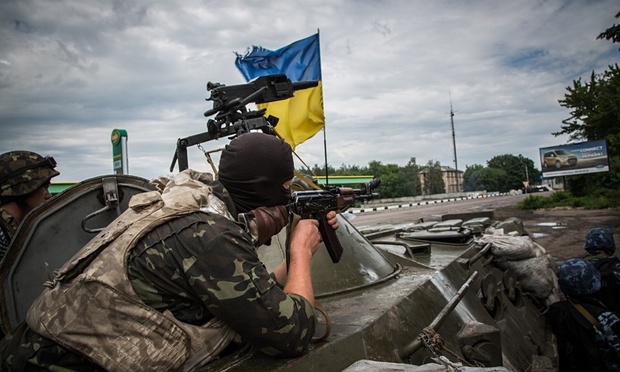 Ukrainian soldiers at an army checkpoint near Sloviansk. “There is shooting all the time,” he said. A 47-year-old former police officer from Donetsk whose real name is Oleg Gorlenko, he was given his nom de guerre, he said, because he never cheated on his wife. He has been fighting the Ukrainian army for more than a year and does not believe in the current ceasefire. A drive around the utter devastation of the airport and surrounding area with one of the Monk’s men was quickly curtailed after shooting started, apparently from one of the other rebel battalions stationed in the vicinity. Last week, Ukrainians hit a rebel tank in one of the side roads leading to the airport; in places, the two sides’ positions are little more than a mile apart. Large-scale fighting has not broken out but these skirmishes occur almost daily, and conversations with Russian, Ukrainian and western officials in recent weeks give little cause for hope that a quick, peaceful resolution to the conflict is possible. A ceasefire was first signed in Minsk last September, but failed to hold. The second Minsk document was signed after marathon overnight talks in February between the leaders of Ukraine, Russia, France and Germany. It envisaged a withdrawal of heavy weaponry from the frontline, full international monitoring of the Russia-Ukraine border to stop the flow of fighters and weapons from Russia and elections in the rebel territories under Ukrainian law. Everyone remains committed in theory to the Minsk agreement, but nobody really believes it can be implemented – and there is a worrying lack of an alternative. Russia was unwilling to see the rebels’ self-proclaimed republics defeated and prepared to increase its military aid to them if necessary, a source in Moscow said. On the Ukrainian side of the frontline, there is scant hope that February’s ceasefire can lead to lasting peace. “We are dealing with Vladimir Putin who is mentally ill,” said Andriy Gergert, the commander of the eighth battalion of Right Sector, a far-right volunteer grouping fighting for the Ukrainian side outside Mariupol. One of his men was killed in fighting around the town of Shyrokyne last week. Speaking from the group’s base, a former Soviet holiday camp on the shores of the Azov Sea, he was blunt about the solution. “The only thing we can do is kill them. Write that down. We need to kill them all,” said 37-year-old Gergert, who before the war worked as a veterinary surgeon in western Ukraine. The conflict, which began more than a year ago, has taken about 8,000 lives, as Ukrainian forces have moved in to counter the local rebel movement in Donetsk and Luhansk regions, which has received financial and military support from Russia. The daily reports from international monitors stationed in the region make grim reading. Frequently, the Organisation for Security and Cooperation in Europe (OSCE) observers are barred from proper observation of military equipment by both sides, and have no way of knowing what is being moved around when they are not observing a particular area. Both sides have been accused of ceasefire violations, though the OSCE accused rebel forces of starting the most serious battle of recent weeks. Russian and US sources have both in recent weeks claimed their political leaders are committed to the Minsk accords, but each suspects the other is bent on escalation. The US is not officially involved in the implementation of the agreement but is keen to keep playing a role, fearful that an EU split and preoccupied with its own problems is unable to stand up to Russia. Moscow sees an American hand in decisions such as an intensified economic blockade of the separatist areas in recent weeks and the appointment of Mikheil Saakashvili, former Georgian president and Russian bête noir, as governor of Odessa region. “Obviously [Ukrainian President] Poroshenko doesn’t make those decisions himself, it’s US escalation, and Russia will counter that with further escalation,” said a source in Moscow with direct knowledge of Kremlin policymaking on the issue. So far, open military intervention has been avoided for fear of damaging relations with the west even further, but there is a resolve that Ukraine cannot be allowed to regain control of its territories without a settlement the Kremlin deems acceptable. “The ‘economic part’ of the government is worried about the effect that events in Ukraine is having and would happily withdraw completely, but the ‘political part’ is united and will act in whatever way is necessary,” said the source. In Donetsk, rebel leaders are counting on this support from Russia. “Minsk brought Russia into the process and forced it to become a guarantor of the situation,” said Alexander Khodakovsky, a former Ukrainian special forces commander who has become one of the top Donetsk rebel leaders. With Russia unwilling to allow proper international monitoring of the border, Kiev is wary about fulfilling its own part of the bargain. “I suppose I have to tell you officially that we still believe in it because I’m going to Paris tomorrow, and why would I go and spend hundreds of euros on the flight ticket if I don’t believe that it’s getting us somewhere,” said Vadym Prystaiko, Ukraine’s deputy foreign minister, during an interview in Kiev last week, just before leaving for the latest round of talks. “It’s becoming a mantra, every European leader will start by saying that ‘Minsk should be implemented’. A European diplomat in Kiev conceded that the reason for the public adherence to Minsk is a fear of what the alternative could be. Rebel leader Khodakovsky said that, while the full Minsk accords were impossible to implement immediately, a ceasefire was needed to “allow heads to cool down” on both sides before real negotiations started. This scenario, of a “frozen conflict” with Donetsk region as a de facto independent statelet backed financially by Russia, is one possible outcome. With Ukraine on the brink of economic catastrophe and the war in the east straining the economy, some in Kiev say this might not be the worst outcome. “It’s becoming very popular in Ukraine, the question of why we would send our children to die for reunification with people who don’t even want us to be with them,” said Prystaiko. However, he said, the problem with such an approach was that Ukraine did not know whether Russia, or the rebels, would stop with what they had. If a lizard allowed a bird of prey to eat its tail, said Prystailo, it could escape faster. As Ukraine’s appetite for the bloody fight to win back the Donbass region wanes, Russia is attempting to deal with the situation by dispatching top officials to Donbass on secret visits and bringing rebel leaders to Russia for consultations. “All the bureaucratic elite left; the people in charge now have no experience of running a region. But to be honest, we expected Somalia and it’s been better than that,” said the Moscow source. Ministers of the self-proclaimed Donetsk People’s Republic frequently travel to Rostov, across the border with Russia, to meet Russian officials who are “couriering” the republic, according to a Russian source in Donetsk. Vladislav Surkov, the secretive “grey cardinal” who is regarded as the architect of Vladimir Putin’s political system and runs Ukraine policy in the Kremlin, had also visited the region recently to demand the local leaders come into line, said two Russian sources. Others, however, said Surkov demanded the rebels fell into line and kept to the ceasefire. Alexander Zakharchenko, head of the Donetsk rebels, was not encouraging about the prospect for peace, however, during an interview last week in his Donetsk office, adorned with a portrait of Putin and a medieval knight’s suit of armour. Much of Donetsk region, including the key port city of Mariupol, remains under Ukrainian government control, a state of affairs that Zakharchenko said he wanted to change. “Our two main tasks are to liberate the illegally occupied territories of Donetsk region and to end military action,” said Zakharchenko, as he chain-smoked cigarettes. When it was pointed out that these two tasks did not appear compatible, unless he simply planned to walk his men peacefully into Ukraine-held territory, Zakharchenko snapped. “When we want to go somewhere peacefully, we will go there. We always do whatever we want, and we can go peacefully wherever we like, like we went peacefully to Ilovaisk, Debaltseve, Uglegorsk,” he said, listing the bloodiest rebel victories of the past year, which most people believe came with help from regular Russian forces, although Russia and the rebels deny it.